The climate here in Northern California is perfect for tomato-growing, so it’s not surprising that Yolo County grows over 1.5 millions tomatoes each year. With so many delicious tomatoes in our region, we always look forward to creating tomato dishes at our restaurants each summer. 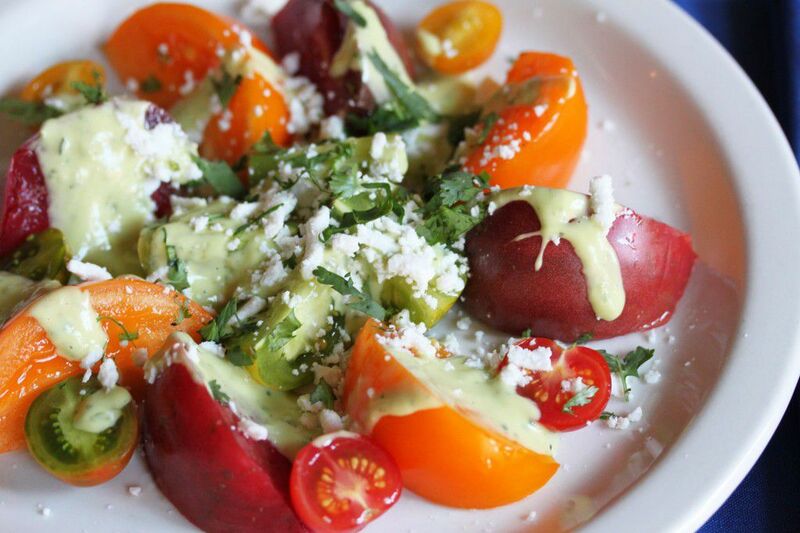 Our Heirloom Tomato Salad with Avocado Dressing is one of our best-selling salads at Centro Cocina Mexicana, so we’re sharing the easy, but delicious recipe with you! Combine avocado, lime juice, vinegar, cilantro, garlic, and salt in bowl of food processor and blend to a puree. With machine running, add oil in a slow, steady stream. Transfer mixture to a mixing bowl and whisk in buttermilk and chives. Taste for salt. Slice tomatoes and arrange on two serving plates. Season the tomatoes with salt. Drizzle the avocado dressing over the tomatoes. Garnish the salads with the crumbled cheese and chopped cilantro.